I had a great time tasting through the new Brittan Vineyards lineup and chatting wine with one of the Oregon iconic winemakers, Robert Brittan. One of the standout Oregon producers of Oregon Chardonnay and Pinot Noir, Brittan Vineyards is guided by superstar winemaker Robert Brittan, formerly winemaker at Stags’ Leap Winery in Napa. Robert is a graduate of the UC Davis Viticulture and Enology program who started Brittan Vineyards in 2004. Robert acquired a 128-acre hillside property with soils that are a mixture of glacial deposits and volcanic material, with a predominant presence of broken basalt. The volcanic material clearly adds to the wonderfully stony aspect in the wines. In 2004 there were 18 acres of existing vines but Robert needed to replant nearly half of the rootstock. This included one of the first plantings of the Swan clonal selection of Pinot Noir in Oregon. After dropping all of the crop in 2005 to allow the vines to get better established, the first two Pinot Noirs from the mature vines on the property came from the 2006 vintage, a total of 720 cases. In the spring of 2008, an additional 3.5 acres of Pinot Noir were planted, which are now in production— the rocky soils and low water retention often means that it takes five years for a vine to get into production. In addition to the Pinot Noir, Robert has 4 acres of Chardonnay and 1.5 acres of Syrah have been planted. In addition to his own wines, Robert serves as the winemaker for several other brands, including Blakeslee, de Lancellotti, Fairsing, Noble Pig, Winderlea and Youngberg Hill. The new Brittan Vineyards releases are some of the most impressive wines out of Oregon that I have tried in the past year. Check out the absolutely stunning 2016 Brittan Vineyards Chardonnay (WWB, 94) which has just incredible tension and range. Just as good was the 2015 Brittan Vineyards ‘Gestalt Block’ Pinot Noir (WWB, 94) is an exceptional Pinot Noir that has incredible terroir and a wonderful sense of place. 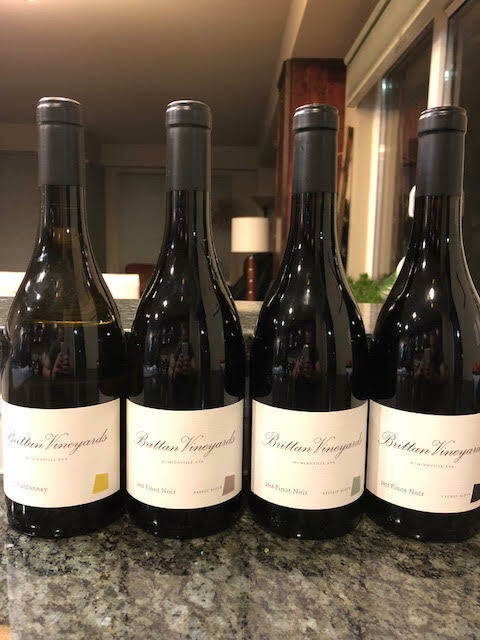 Learn more about the great wines of Brittan Vineyards at http://www.brittanvineyards.com Here are the new Pinot Noir releases by Brittan Vineyards.